On-time performance for the evening commute improved only slightly compared with the first 11 months of 2017, a year that ended as the railroad's worst in nearly two decades. The Long Island Rail Road has been at its worst when commuters needed it most: during rush hours. The railroad’s morning on-time performance for 2018 through November fell to 88 percent, a drop of 3.5 percentage points compared with the same period last year, statistics show. Things have been even worse during the evening commute, when 86.6 percent of trains have run on time — only slightly better than the LIRR's PM on-time performance of 86.2 percent in the first 11 months of 2017, a year that ended as the railroad's worst in nearly two decades. There have been 3,022 more delays this year than in 2017, with the busy Ronkonkoma branch — which travels through a congested Nassau County bottleneck where four branches share two tracks — faring the worst. That branch has an on-time performance rate of 86.1 percent overall and 84.8 during rush hours. The Far Rockaway branch — often routed from Penn Station — is doing the best, with an overall on-time performance of 94.6 percent and 90.7 percent during peak periods. The LIRR considers a train late if it arrives at its final destination more than five minutes and 59 seconds after its scheduled time. Ronkonkoma commuter Stuart Greenberg, who has been riding the LIRR since 1975, said he can’t recall a time when the railroad has had as many issues. “It’s getting to be almost a daily occurrence,” said Greenberg, 75, a computer programmer who noted the LIRR’s on-time figures don’t capture the full impact on customers. A train that runs four minutes late is considered "on time," but could delay a rider by an hour or more if it causes him to miss a connection. “So, if they’re looking this bad, it’s even worse than it seems." The delays, which work out to about nine more late trains a day, is a testament to the challenges the railroad has faced in 2018 — a year plagued with chronic problems, like the effects of snow and wet leaves on the tracks — and new problems, including record-high ridership and complications in installing a second track on the railroad’s Main Line in Suffolk County. Although some obstacles, including broken rails and switch troubles, have persisted throughout the year, the railroad’s toughest trials were concentrated in a few key months, including January, the LIRR’s worst month in 22 years. The railroad’s low point came five days into 2018, when a blizzard — combined with a train car shortage — resulted in 430 late trains in a single day. Overall, the railroad reported 21,973 delays in the first 11 months of 2018. The No. 1 cause of delays was "customers," which accounted for 4,010 late trains. The category refers to delays in loading and unloading riders. The sharpest increase in delays was due to "weather and environmental causes," which accounted for 3,960 delays — nearly twice as many as the same period in 2017. That includes delays caused by wet leaves on the tracks — a growing problem for the LIRR in recent years. Not only have the number of delays grown, but so has their length. The average LIRR delay this year lasted 13 minutes, up from 12.2 minutes in 2017. Through November, there were 3,877 trains late by more than 15 minutes, up 30 percent from 2017. Also rising since last year are the number of trains canceled and terminated early. LIRR president Phillip Eng, who was appointed to the position in April, acknowledged the on-time stats this year “are not where we want them to be,” but added there are indications that efforts to reverse deteriorating service through his LIRR Forward program are taking hold. The initiative has expedited replacement of the railroad’s most problem-prone switches, protected infrastructure from weather, and sought to prevent predictable problems before they occur. Nowhere has the railroad’s deterioration in on-time performance been more apparent than during the early rush hour — between 6 a.m. and 10 a.m. — when it operated 88 percent of its trains on time, down from 91.5 percent over the first 11 months of 2017. Although the problems that have plagued the railroad in 2018 are not isolated to a specific time of day, the challenge of choreographing a morning rush hour on the LIRR is different from in the evening, as it requires funneling tens of thousands of commuters from 122 stations primarily into one place: Penn Station. Some 84,000 LIRR riders arrive each morning at Penn — about 12,000 more than those who travel from the station during the evening peak period. A problem during the morning rush also is more likely to bleed into the evening rush, which begins just six hours later. The Port Washington line has been faring the best in the morning, with an on-time rate of 90.5 percent. The line is the only branch not to run through Jamaica, a hectic transfer point where commuters often get delayed waiting on connecting trains. The consequences of running late in the morning also could be more severe than in the evening, riders said, because most passengers are on their way to work, school or appointments. All 11 of the railroad’s branches saw a drop in punctuality during the mornings in 2018. 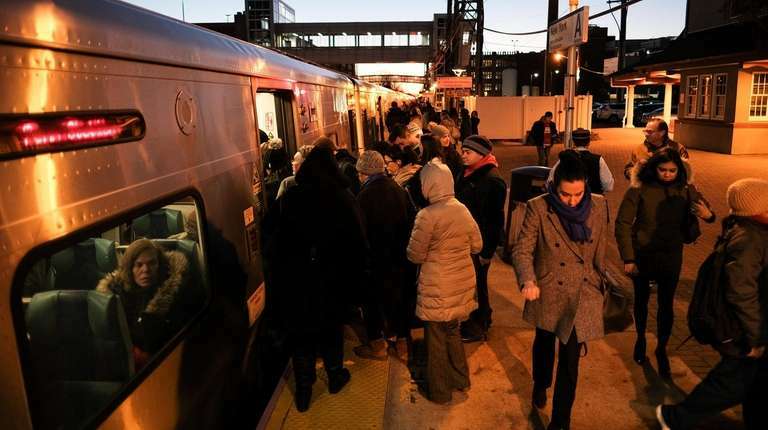 The Ronkonkoma line, which carries 13,000 riders daily, struggled the most in the mornings, with an AM rush on-time performance rate of 93.5 percent. In January, just 67.6 percent of Ronkonkoma trains reached their destinations on time during the morning — the lowest rush-hour on-time performance for any branch in any month this year. The branch also was particularly impacted by work on the railroad’s Double Track project over the summer. Railroad officials have said the long-term benefit from the project, which doubled train capacity between Farmingdale and Ronkonkoma, was worth the short-term inconvenience. Even traveling at the earliest part of the morning rush in order to get to her Brooklyn construction job by 7 a.m., Meredith Kassner-Gomez, of Locust Valley, said she repeatedly has been delayed during the past year. “It seemed to be worse over the summer, because they were doing construction or whatever,” said Kassner-Gomez, 38, who lives near the Oyster Bay Branch but commutes out of Hicksville, where more trains run. The railroad’s explanations for delays offer little solace to many commuters, for whom arriving late to work in the morning and home in the evening increasingly has become common. Although a little better than last year, the LIRR’s evening rush, which lasts from 4 p.m. to 8 p.m., remains its most challenging stretch. Through the first 11 months, the railroad’s PM peak on-time performance sat at 86.6 percent — up 0.4 percentage points over last year, but still worse than the railroad’s morning rush, weekday off-peak and weekend service. The Montauk branch has performed the worst during the evenings this year, with 82.5 percent of trains running on time. The branch is hampered by sharing trains with the Babylon line — the busiest of the LIRR’s branches — and by operating on a single, unelectrified track east of Babylon using diesel trains, which are more prone to breakdowns than electric ones. The line is also prone to PM delays during the summer because of Hamptons-bound crowds. For LIRR customers who already may have endured a rough morning commute, evening delays can be particularly trying. The fragile state of Penn Station, where three railroads share 21 tracks, can particularly hamstring the LIRR in the evenings. Some 72,000 LIRR commuters converge on the cramped station within a four-hour period, contributing to delays caused by prolonged boarding and disembarking times — consistently the No. 1 category of delays for the LIRR. A service disruption during the evening peak — especially one originating at Penn Station — can have far more severe consequences for riders, who are sometimes sent scrambling to find transportation alternatives. MTA Police occasionally take the drastic measure of restricting access to Penn Station to control crowding, leaving scores of commuters piling up by the 34th Street entrance. Farmingdale commuter Gerard Toscano said that unlike in the mornings — when he can occasionally avoid LIRR troubles by working from home — he has little choice but to tough through service problems in the PM rush. “The biggest pain point is coming home . . . That’s the biggest, agonizing thing for me. You make plans for that particular night and, all of a sudden, there’s a train delay. And now you’re going to be late,” said Toscano, an information technology director who has been commuting on the LIRR for 22 years and believes 2018 “without a doubt” has been the worst. Amtrak’s efforts to repair and renew aging infrastructure at the 113-year-old station have contributed to such evening rush-hour meltdowns at Penn Station being less frequent. Through November, there were 1,889 delays attributed to Amtrak — a 52 percent drop from last year, when infrastructure failures at Penn Station caused multiple PM rush-hour meltdowns. Only one LIRR branch has scored an on-time rate of more than 90 percent during the evening rush this year — the Far Rockaway branch, whose trains frequently depart from Atlantic Terminal and, therefore, avoid some of the congestion at Penn Station. The railroad’s overall on-time performance figures this year have been helped somewhat by its performance during weekday off-peak hours. With lighter ridership and fewer trains in service, the railroad is able to more easily work around a problem outside of rush hours. That’s why, in part, the LIRR and Amtrak historically have scheduled repairs and maintenance work that requires track outages during overnight hours and weekends. But the LIRR’s on-time rates outside of peak periods also have fallen from last year. Weekday off-peak on-time performance is 90.4 percent, down from 91.6 percent last year. And 93.1 percent of weekend trains have operated on time, down from 94.7 percent in 2017. Martin Robins, director of the Alan M. Voorhees Transportation Center at Rutgers University, said some of the causes for the worsening performance of the LIRR — and other large railroads in the United States — are not easily remedied. Recurring problems, such as severe weather, can be compounded by aging infrastructure, underinvestment and growing ridership. The LIRR, which turned 184 this year, is on pace to carry more than 89 million riders this year — the most since World War II. Eng acknowledged the railroad will need to do “more with less” as its parent agency, the Metropolitan Transportation Authority, and projects a budget deficit of $1 billion by 2020 — even with a proposed 4 percent fare increase scheduled in March. The LIRR already has proposed several cost-cutting measures, including cutting train fleet-maintenance costs and restricting hiring. The railroad, which employs about 7,900 workers, expects to spend $2.069 billion next year, up 2.5 percent from this year, according to budget documents. Still, MTA officials have said there are reasons for optimism. The railroad is undertaking more than $100 billion in infrastructure improvements, including major capacity-expansion projects like a third track between Floral Park and Hicksville, and East Side Access, which will give the railroad a second Manhattan terminal. State Sen. Todd Kaminsky (D-Long Beach) agreed that the LIRR “desperately needs an infusion of new money from Albany” to modernize its aging and breakdown-prone infrastructure. But Kaminsky said it also needs to show more urgency in addressing its problems, as it did during 2017’s so-called “summer of hell.” Faced with a significant reduction in capacity at Penn Station because of Amtrak’s repair work there, the railroad delivered a largely reliable commute throughout July and August of last year. Of the 21,973 delays in 2018, 3,960 were attributed to "weather and environment" — an increase of 1,936 from 2017. The No. 1 cause for delays was customers, causing 4,010. The category refers to delays in loading and unloading riders. Brutal winter weather, combined with a train car shortage, contributed to the LIRR having its worst on-time performance month for 2018 and the worst-ever month in 22 years. In the first week of the year, winter storms resulted in numerous delays, cancellations and service suspensions — all while the railroad’s fleet of trains was depleted because of train car wheels damaged by slippery rail conditions. 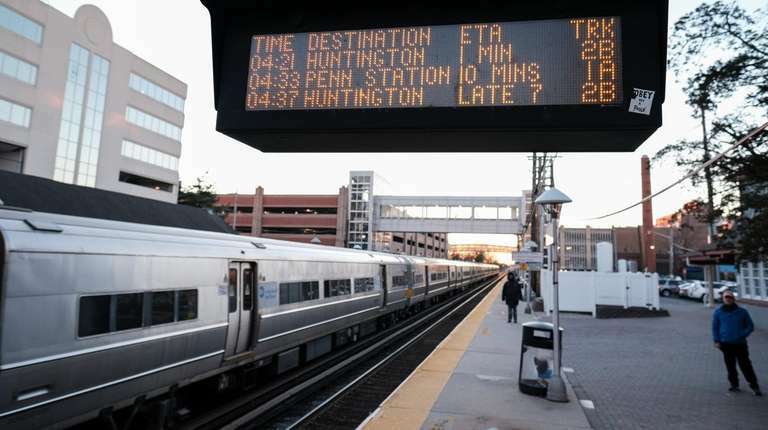 On-time performance in the morning rush dipped below 70 percent on the Ronkonkoma and West Hempstead branches, and in the evening rush on the Huntington, Montauk and Oyster Bay branches. With most of the sidelined trains back in service, and with weather improving, the LIRR rebounded to have one of its best months. The biggest cause for delays during the month were people and cars on tracks. One such trespassing incident — an unauthorized person on the track — in Westbury on Feb. 20 resulted in the railroad temporarily suspending service on the Oyster Bay, Port Jefferson and Ronkonkoma branches during the evening rush. The incident resulted in 57 late trains and 4 cancellations. Four separate nor’easter storms made for another rough month. Winter storm Riley on March 2 came with high winds that toppled several trees and utility poles onto the tracks and led to the railroad suspending service on five branches during the evening rush. Another storm, five days later, left the railroad operating on just one branch — Port Washington — for part of the day. Other unanticipated problems also plagued service, including a five-alarm fire March 16 at a recycling plant in Jamaica, next to the LIRR’s tracks, and a train hitting a car in Mineola on March 24 after the driver misunderstood GPS directions and drove onto the tracks. With the winter over, commuters experienced a much-improved commute — the LIRR’s best month since September 2016 and the only month this year that met the railroad’s systemwide on-time performance goals. On April 9, 20 and 24, the railroad ran 100 percent of its trains on time during the morning rush. Still, the railroad dealt with some challenges, including a damaged signal in Queens on April 13 that caused multiple delays during the PM rush, and a disabled train in Queens on April 18 that caused morning delays. This was another solid month for the railroad, which had four perfect morning commutes. The railroad’s Montauk and West Hempstead branches also exceeded on-time performance goals. One of the railroad’s biggest snags came May 3, when Amtrak’s lateness in wrapping up planned overnight repairs near Penn Station snarled the morning commute, causing 60 delays in a single rush hour. A pedestrian train strike in Kew Gardens on May 23 and heavy crowding on the Friday before Memorial Day also slowed service. The Far Rockaway, West Hempstead and Port Jefferson branches exceeded their on-time goals for the month. Delays caused by loading and unloading large crowds of riders for special events — including the Belmont Stakes, the U.S. Open golf tournament in Shinnecock Hills and a Dropkick Murphys concert in Forest Hills — comprised more than a quarter of 416 late trains. Fire department activity near a railroad crossing in Westbury on June 7 also caused more than 50 delays during the morning rush. At the halfway point of 2018, the railroad’s year-to-date on-time performance was 0.4 percent better than during the same period in 2017. On-time performance took a turn for the worse in the first full month of the summer, with 34 events resulting in 10 or more late trains. They included a train fatally striking a trespasser on the tracks in Queens. On that day, 133 trains ran late. The railroad ran into other major rush-hour service problems the same week, including those caused by a disabled Amtrak train near Woodside and signal trouble near Babylon. On July 21, a train derailed at the West Side yard near Penn Station, causing delays that lasted into the evening rush hour the following Monday. The difficult month brought the year-to-date on-time performance below the previous year. The month included major delays caused by a lightning storm that sparked a fire at a New Hyde Park electrical substation, two fatal train strikes in one morning, an LIRR employee being injured by an electrified overhead wire in Queens, and technical problems with the installation of new switches in Central Islip as part of the Double Track project. The U.S. Open tennis tournament also caused delays in loading and unloading large crowds of riders in Queens, contributing to Port Washington’s evening rush-hour ridership coming in at just 72.4 percent. The LIRR rebounded somewhat this month, but still displayed its vulnerability to weather. Storm-related weather conditions Sept. 6 were blamed for 36 delays and 4 cancellations during the evening rush hour. Its worst rush hour of the month came on the morning of Sept. 11, when a “track condition” at a major switching location west of Deer Park — where the railroad was in its final stages of installing a second track — caused 43 delays. With its Double Track project finished and providing added capacity in Suffolk County, and with Amtrak completing lengthy repairs that limited the LIRR’s access to tracks at Penn Station, the LIRR delivered its best performance in six months. LIRR president Phillip Eng said the improvement also was a testament to his LIRR Forward initiative, which combated the most frequent cause of delays, including faulty switches. The railroad’s worst rush hour of the month came on the morning of Oct. 11, when a trespasser inside one of the East River Tunnels caused 46 trains to be late and another 13 to be canceled. The LIRR had its worst month since January, in large part to trees shedding their leaves onto the tracks, making for slippery conditions on the rails. The LIRR said 22 percent of its delays in November were caused by “low adhesion.” Two PSEG electrical problems also resulted in 220 delays — the majority of them occurring on Thanksgiving. A Nov. 2 Amtrak derailment inside a Hudson River train tunnel connecting to Penn Station, and a heavier-than-expected snowstorm on Nov. 16 were responsible for more than 200 of the nearly 1,400 delays.